NEW YORK—The city’s Education Department is searching for alternative space for the charter school it stripped of its classroom space. Some 200 middle-school students from Harlem Success Academy 4 are left without a school to attend in September after the department revoked the school’s co-location approval last week. 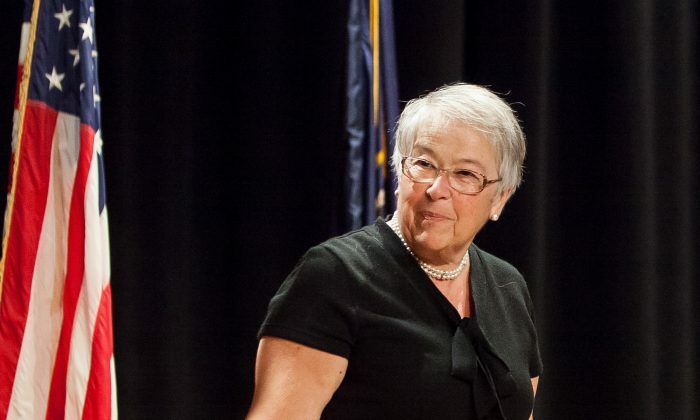 Schools Chancellor Carmen Fariña said that the department is now looking for a new space for the children. Harlem Success Academy 4 needed more classroom space as it was growing out of its current digs in two public school buildings. Harlem Success Academy 4 is the state’s highest scoring middle-school on standardized math tests. Last year it asked for a new space to move into. The request was granted in October, but on Feb. 27 the new administration reversed its decision. Harlem Success Academy 4 was supposed to move into a school building complex at 117th Street and Lenox Avenue in Harlem. The original plan was that one of the four schools currently housed in the complex, P.S. M811 Mickey Mantle, would enroll less students every year to make space for the charter school. But P.S. 811 serves emotionally disturbed and autistic students. The new administration said it will block all co-locations that displace special needs students. The Success Academy co-location was nixed, along with two other Success Academy Charters and six district school co-locations. Another 40 co-locations that were also under review went through. “We’re not penalizing them, but we’re also not going to hurt the kids who are in that building,” Fariña said during her appearance on Good Day New York television show Mar. 7. She said the department is “looking for a space for children who are being displaced”. She didn’t provide any further details. Fariña also took back her comment from a Mar. 6 press conference, where she said the students from Harlem Success Academy 4 “are on their own”. “I shouldn’t have said it,” she acknowledged. According to the original proposal, even if less special needs students were enrolled to P.S. 811 in September, the building complex would end up over capacity. The manual the Education Department uses to evaluate available school spaces, called the “Blue Book”, has drawn a lot of criticism from parents and teachers. “If you speak with any parent he or she will tell you that the Blue Book is a joke,” said Mona Davids, president of the New York City Parents Union, a parent organization currently suing the city to stop 42 co-locations approved last fall, most of which got re-approved by the Education Department on Feb. 27. “The Blue Book would call a janitors closet a classroom,” Davids said. Fariña said she would review the Blue Book as well.